Looking for unique gift ideas to impress the recipients? 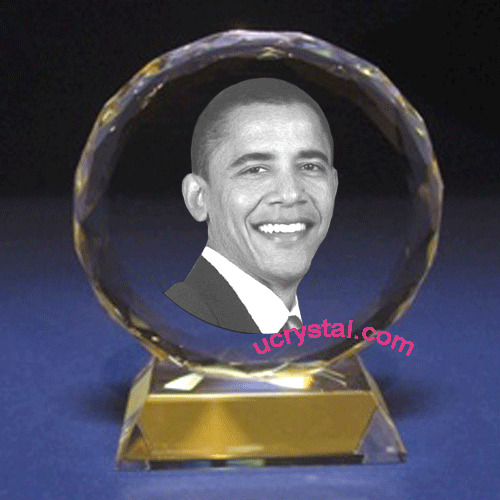 How about extra-large personalized photo engraved crystals…? 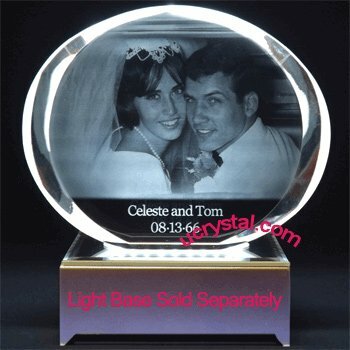 Personalized photo crystal engraving has been recognized as unique gift ideas due to its amazing ability of imprinting the chosen images inside high-quality laser crystals. People often wonder how an image can be put inside a crystal while outside surfaces are still smooth. Unlike some pictures glued between two pieces of plastics, laser engraved photo crystals are one piece of solid crystals. The image creation owes much to modern laser technology, computer aided control, and digital photography. However, the most important factor for creating an amazing piece is the craftsmanship our team master and cherish. 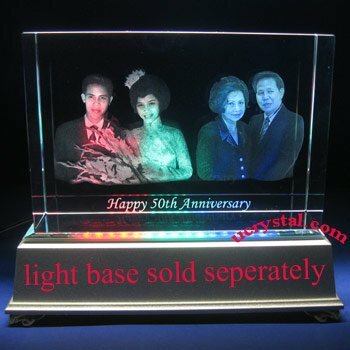 Ucrystal.com specializes in full services for both 2D personalized photo crystal engraving and 3D personalized photo crystal engraving. Not only we have regular sized crystals with various shapes and polishes, but we also have prepared inventories for extra-large laser photo crystals to meet customers’ needs. We have stocked up extra-large photo crystals in response to customers' interests, especially heart-shaped photo crystals. As you can see from this page, we have popular crystal hearts with or without attached crystal base. 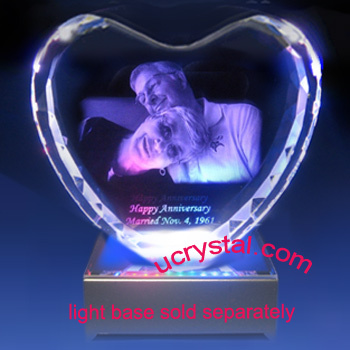 If you are looking for anniversary gift for your loved one, heart photo crystals deserve special considerations. 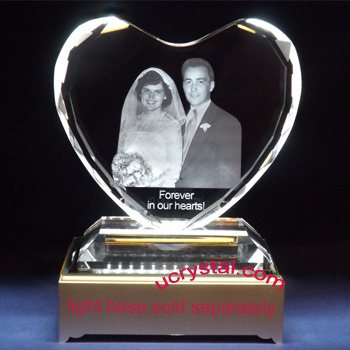 Imaging your favorite wedding photo reemerges inside those beautiful photo crystal hearts, they will for sure keep your loving memory for years to come, especially engraved with your heartfelt text/message. No matter it’s your 1st wedding anniversary, 25th wedding anniversary, or 50th wedding anniversary, these personalized wedding anniversary crystal heart gift will be cherished for a long time. In addition to personalized photo crystal hearts, we also have many other shapes and polish of the laser photo crystals to meet other needs of our customers. 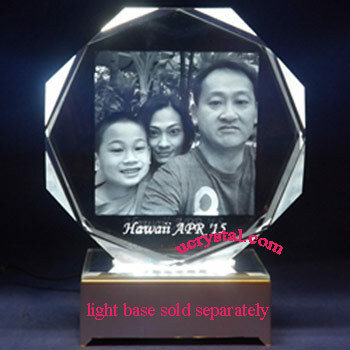 There are octagonal photo crystals, round laser photo crystals, as well as rectangular plaque photo crystals. The edges of the laser photo crystals consist of straight edges, multi-facets, and slanted edges to accommodate different occasions. They are perfect personalized photo crystal gifts for Valentine's Day, birthdays, Mother’s Day, Father’s Day, and many other occasions. Some of the laser crystals are one piece; others have firmly attached crystal base. 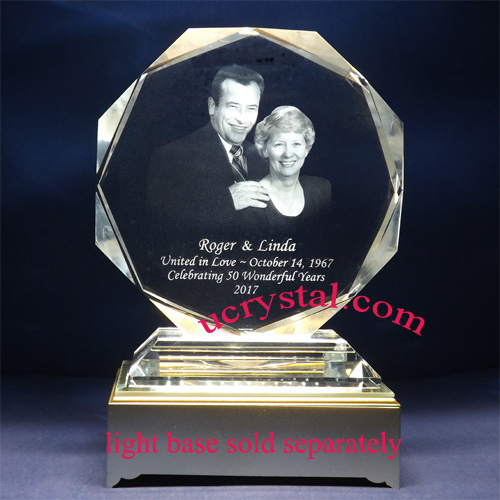 These large crystals are not only pleasant for single person engraving, but they are also delightful for group photos. Our popular extra large crystal choices are octagonal crystals, round crystals with bevel edges and flat edges, oval photo crystals, as well as shield crystals. Octagonal crystals are often used for awards or family group photos while shield crystals are most welcome by people in medical field or in computer fields. 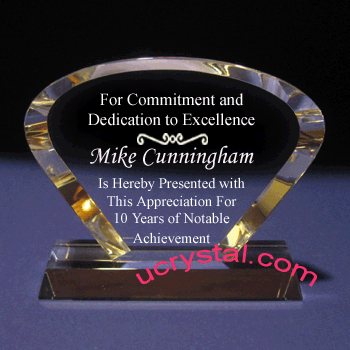 The different choice of rectangular crystals are also highly sought after for making awards, and anniversary gifts. Triple-panel crystals, with special blue crystals flanked on both sides are considered elegant and standing out among others. 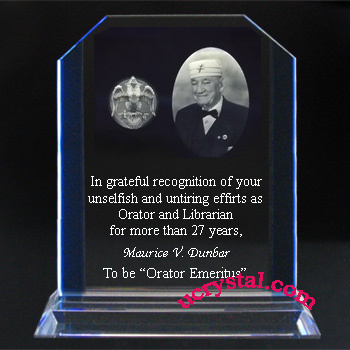 The half-dome crystal, revered for its simplicity and style, are often purchased as awards and plaques. Our full line of 2D or 3D photo crystal engraving service starts from photograph cropping, background removal, brightness and contrast enhancement, to the final laser precision engraving. 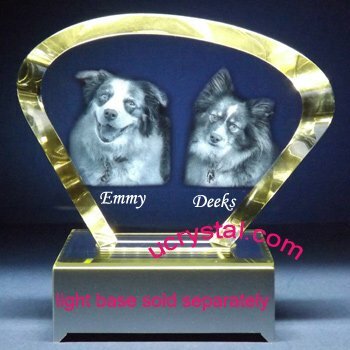 Additionally for 3D personalized crystal engraving, we convert a single front view photo into 3D model for both people and pets prior to engraving. We also have the capability to construct 3D models based on your requirements, or convert your own model (obj format preferred) into our machine-recognized format for production. For 2D photo crystal engraving, we use as many as 8 layers to enhance the contrast and brightness so that the fine details of your previous photo and memory can be reproduced to their fullest. Our laser crystal engraving technicians are experts in optics and laser physics. The combination of their expertise and the emphasis on customer services are the best way to ensure your engraving results to be the best in class. 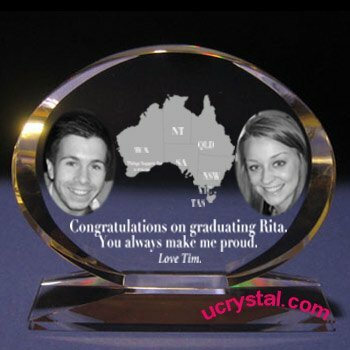 Please give us the chance to help you preserve your special moments by ordering a 2D or 3D personalized photo engraved crystal. We are confident you will then know why almost all customers rate us 5 stars or 100% positive on Testimonial Robot (3rd party rating services), yelp.com review, and eBay. 5-3/4" x 5-1/4" x 3/4"
We have stocked up extra large photo crystals in response to customers' interests, especially having personalized crystal gifts for wedding and wedding anniversary in mind. There are many 2D or 3D heart shape crystals to choose from. If you are looking for anniversary gift for her or anniversary gift for him, this is the amazing gift idea. When you engrave your favorite wedding picture inside those beautiful photo crystal hearts, especially with your own touching words, “You are the love of my life”, it will become the centerpiece of your home and your loving memory will be persevered for years to come! No matter it’s your 3rd year anniversary, 15th wedding anniversary, 25th anniversary or 50th wedding anniversary, this personalized wedding anniversary crystal gift will be amazed by him or her! We also have other various shapes laser photo crystals available to meet our customers' different tastes. They are polished into such as elegant octagonal photo crystals, and to round laser photo crystals. The edges of the laser photo crystals consist of straight edges, multi-facets, and slanted edges to accommodate different occasions. 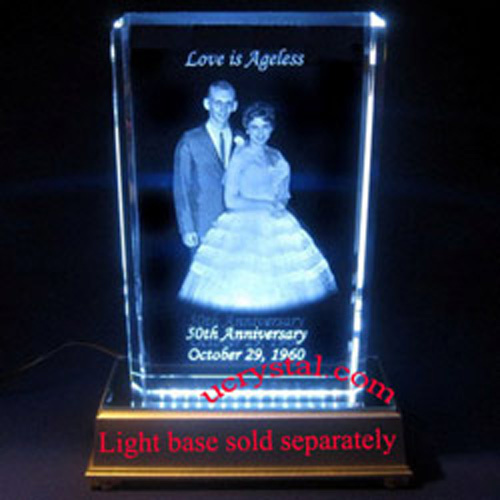 They are perfect personalized photo crystal gifts for Valentine's Day, birthdays and endless enjoyments. Some of the laser crystals are one piece; others have firmly attached crystal base. These large crystals are not only pleasant for single person engraving, but they are also pleasing for group photos. Although these photo crystals can be used for both 2D and 3D photo crystal engraving, the thinner crystals (less than 1” thick) are best to be used for 2D rather than 3D laser crystal engraving. 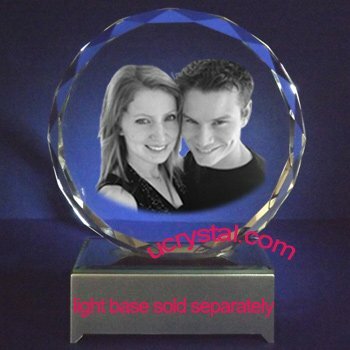 On the other hand, these 2” thick photo crystals are perfect for 3D photo crystal engraving. You can always write or call us if you have any questions. 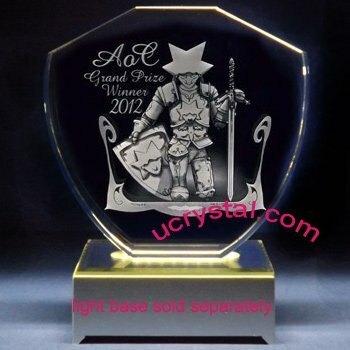 It is important not to be confused between crystal base and lighted base. The former is part of the laser crystal piece, and cannot be separated. The latter is a plastic box that can gives out white lights or multi-color lights when powered by batteries or wall adaptors. The light bases should be purchased separately unless otherwise noted. 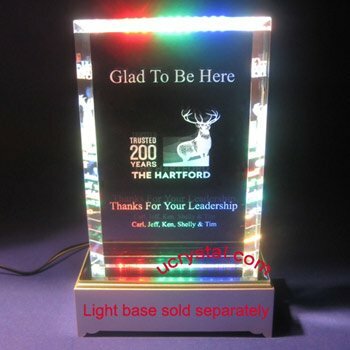 As with all art pieces, lighting condition greatly enhances the visual effects and improves the display results, adding a LED light base will make your personalized 3D photo engraved crystal even more dazzling. 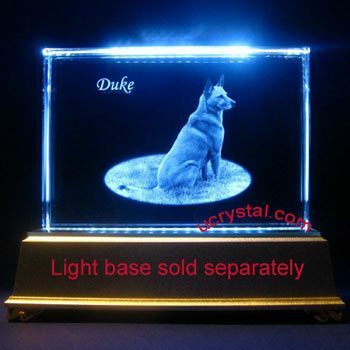 Click the picture of a photo crystal, you will be shown an enlarged photo, the detailed description of the photo crystal, and suitable light bases.